We have over 30 years experience in the fun casino hire industry and since our launch, we've built a reputation for providing a professional fun casino experience in Surrey with a reputation that's second to none. We are recommended for our reliability, customer service and professionalism; no job is too big or too small. We never forget that even though this is our daily business, it's your once in a lifetime day and we'll treat it accordingly. National Casinos provides quality casino gaming tables and all the necessary equipment, together with professional croupiers at a venue of your choice. Our top quality casino tables are all kept in superb condition and feature blue, red or green baize tops. 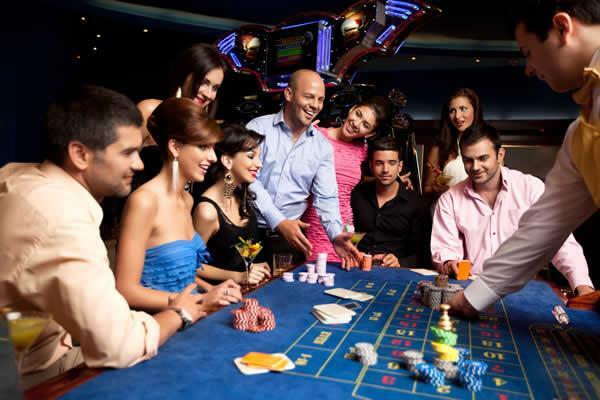 We pride ourselves in offering luxury equipment for the most professional casino hire service in Surrey. Our roulette wheels are full-size and all of our equipment is authentic casino grade, exactly the same as you would find in a real casino. We invite you to compare our quality; no expense has been spared to bring you the finest most realistic experience possible. Our croupiers are professionally trained and very experienced, with excellent customer service skills. They have the knowledge and expertise to bring fun and excitement to your event and are always ready to help your guests and explain how to play and maximise winning potential. There will always be a manager at each event or function to ensure smooth running, together with that personal touch. We select our staff very carefully to ensure that they will not only make your event unforgettable but will also keep National Casinos as leaders in our field with our untarnished reputation for going all out to bring you the best casino hire experience possible from start to finish. Consider bringing something different and unique to your next event with a Fun Casino. Do you want your loved one to really have an unforgettable birthday? Hire a Fun Casino and they will love you forever! Are you getting married in Surrey? Add some glitz and excitement and make that special day even more special; your guests will be talking about it for years to come. Trying to raise awareness and bring some excitement to a new product or business launch? Let us wow the crowd and generate interest with a Fun Casino Event. Want to raise Money for a cherished charity? Over the years, we have helped raise thousands for worthwhile causes and add that little extra sparkle that will make your guests want to delve deeper into their pockets and support you whilst having a great time. We regularly work in all types of venues in Surrey including large hotels, pubs, clubs and restaurants. We also attend private parties at your home or office. Whether it's a private party, wedding reception, charity fundraiser or a corporate entertainment event, please get in touch for free advice or a free quote.